The State Water Project is the largest state-built water project in the United States; its facilities include the tallest dam in the United States, the largest off-stream reservoir in the United States, and the highest water lift in the world. 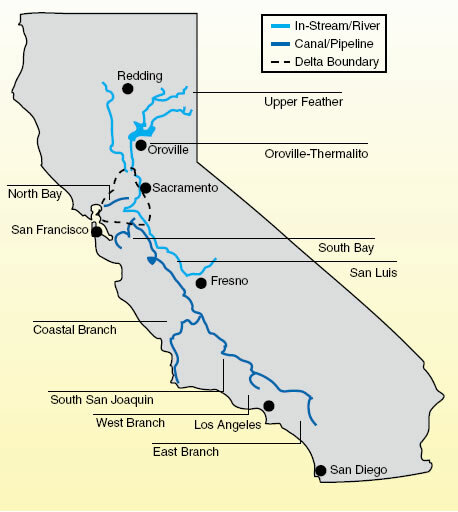 The project nearly spans 600 miles from northern California to Southern California, delivering on average 2.4 million acre-feet of water through an interconnected system of 34 storage facilities, 20 pumping plants, four pumping-generating plants, 5 hydroelectric power plants, and about 700 miles of canals, tunnels and pipelines. The State Water Project essentially begins at Lake Oroville, 70 miles north of Sacramento where the 770-foot Oroville Dam, the tallest in the world, impounds the Feather River and forms the 3.5 million acre-foot Lake Oroville. The dam provides water storage, flood control, and recreational facilities. Stored water released from the dam flows down the Feather River and joins the Sacramento River as it flows into the Delta. 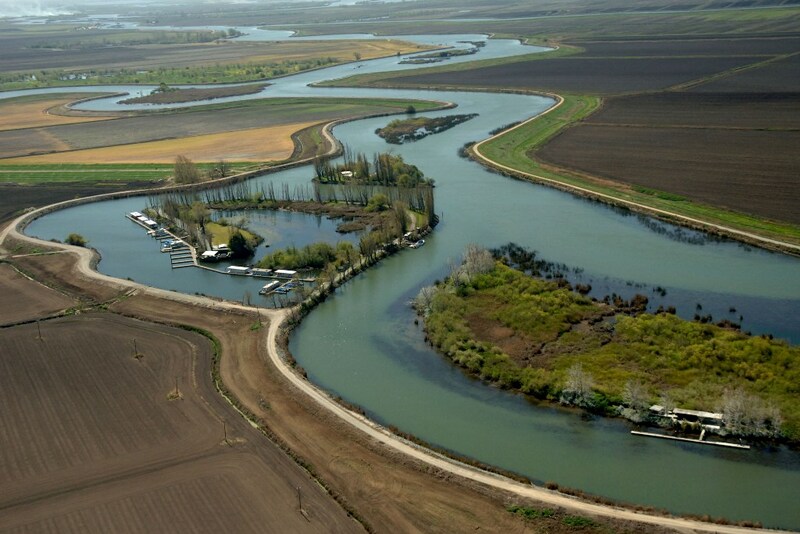 The Delta is the hub of California’s water infrastructure systems, a 700-mile maze of sloughs and waterways that surround more than 60 leveed tracks and islands. In the Delta, the Sacramento and the San Joaquin rivers meet, and flow towards San Francisco Bay; along the way, the freshwater will meet with the incoming tide, mingling and forming the largest estuary on the West Coast. The Delta is home to over 750 animal and plant species, many of them threatened and endangered, as well as about 500,000 residents. At 738,000 acres, the Sacramento-San Joaquin Delta occupies just a fraction of the state’s landmass, but plays a central role in state’s continuing water conflicts. You can learn more about this complicated place by clicking here. From Barker Slough in the north Delta, the North Bay Aqueduct branches off to deliver water to Napa and Solano counties; the rest of the water continues south through the Delta to the Harvey O. Banks pumping plant, where 11 pumps lift the water 244 feet and place it into the California Aqueduct. 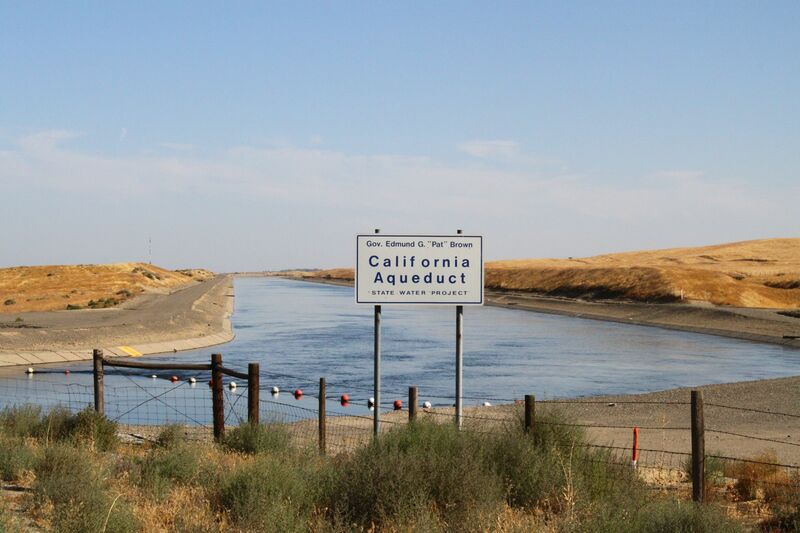 As the California Aqueduct heads south, some water is diverted into the South Bay Aqueduct to deliver water to the Silicon Valley and other Bay Area communities. 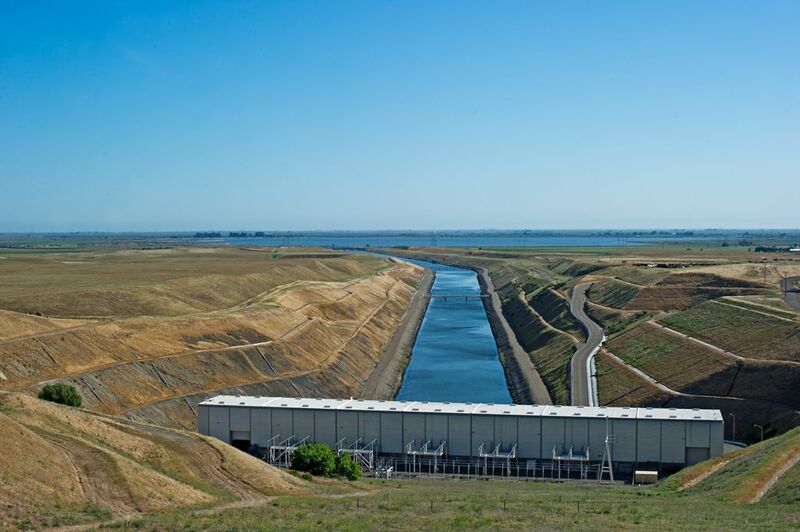 Water continues south to San Luis Reservoir, delivering irrigation water to the San Joaquin Valley and drinking water to Central Valley communities. 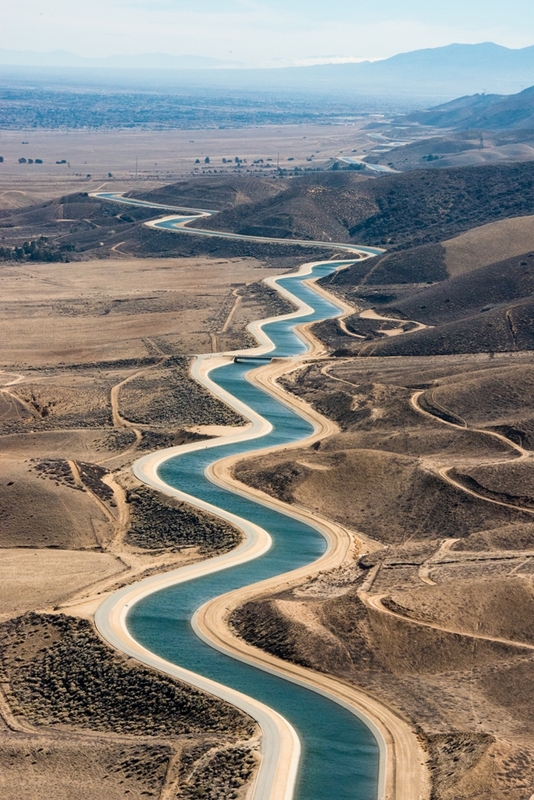 South of Kettleman City, the Coastal Aqueduct branches off to serve San Luis Obispo and Santa Barbara. Click here to take a photo tour of the Edmonston Pumping Plant. The aqueduct continues to the foot of the Tehachapi Mountains where, at the Edmonston Pumping Plant, fourteen pumps lift the water up and over the mountains. At the top, the aqueduct splits into the East and West Branch aqueducts with the western branch continuing on to Pyramid and Castaic lakes and the East Branch continuing south through the Antelope Valley to Silverwood Lake and Lake Perris. It takes 14 to 75 days for water to travel the length of the California Aqueduct, depending on how many pumps are in operation. The end of World War II saw a second “gold rush” as new residents flooded to the state, attracted by the favorable climate and lured by the promise of jobs. The growing population put pressure on the state to develop more water resources to fuel the economic growth. In May of 1951, State Engineer A.D. Edmonston proposed a dam on the Feather River near Oroville, a Delta cross-channel, and aqueducts to convey water to south Bay Area communities, the San Joaquin Valley, and Southern California. Additional facilities were added in 1955 and again in 1957. In 1959, the legislature enacted the Burns-Porter Act, which authorized the issuance of $1.75 billion in general obligation bonds to finance construction of the project. The issue went before the voters in November of 1960, with the measure narrowly winning passage by just 173,944 votes out of 5.8 million counted. 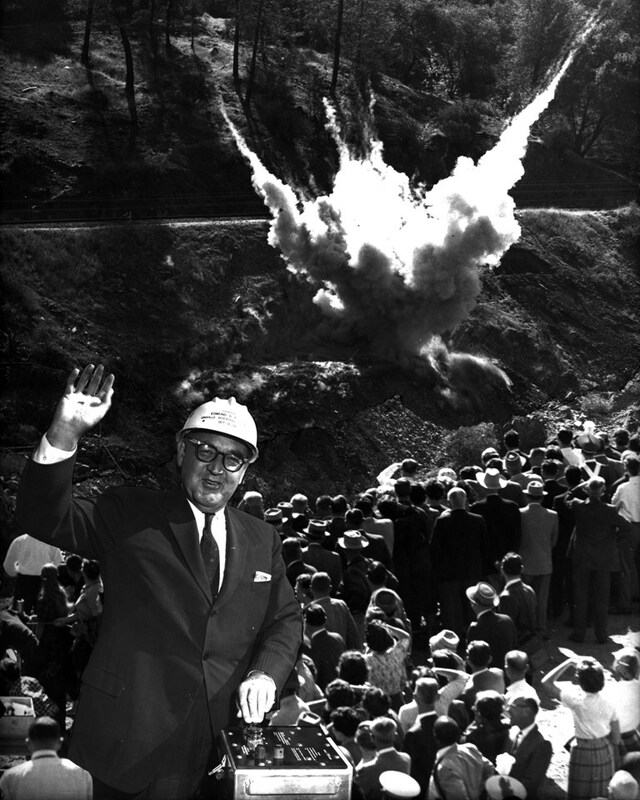 Construction began in earnest after passage of the measure with Oroville Dam being completed in 1967. The South Bay Aqueduct was the first State Water Project delivery system completed with water being delivered to Alameda County in 1962; water would reach Santa Clara County in 1965. Delta facilities were completed in 1968, but it wasn’t until the Edmonston Pumping Plant was completed in 1971 that water finally reached Southern California. By 1973 initial facilities were completed. The Coastal Branch was completed in 1997. Although the State Water Project takes advantage of falling water to generate hydroelectric power where possible, the project generates only about two-thirds of the power needed to run its facilities, making the project one of the state’s largest electrical consumers. Twenty-nine water agencies have contracted for long term deliveries of 4.2 million acre-feet of water. 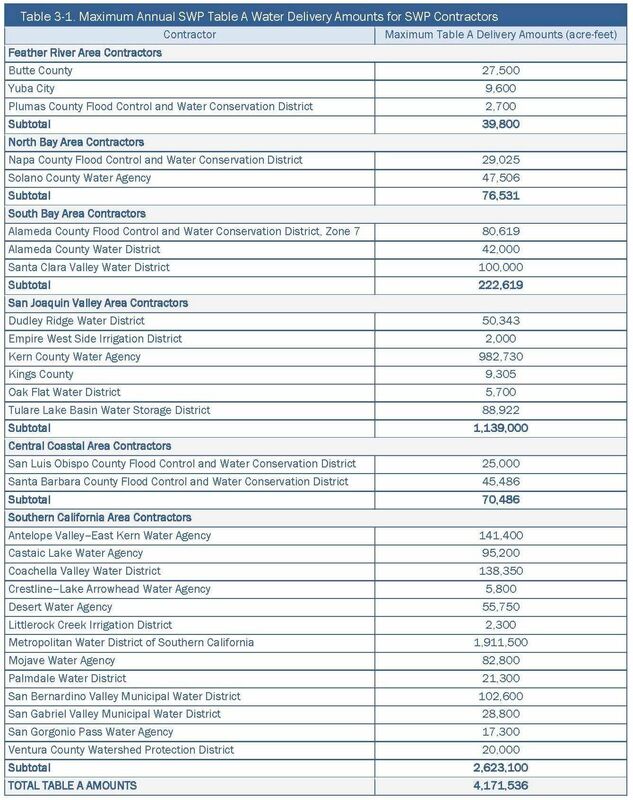 The Metropolitan Water District of Southern California is the largest contractor, holding entitlements to a little over 2 million acre-feet, or about 47% of the water delivered; Kern County is the second largest at 1.1 million acre-feet, or about 27% of the project total. The remaining 26% is split between the remaining 27 water agencies. Although contractors hold entitlements to 4.2 million acre-feet of water, the State Water Project is capable of only delivering on average between 2.5 million and 3.5 million acre-feet. The least amount delivered was 0.55 acre-feet during the 1991 drought. 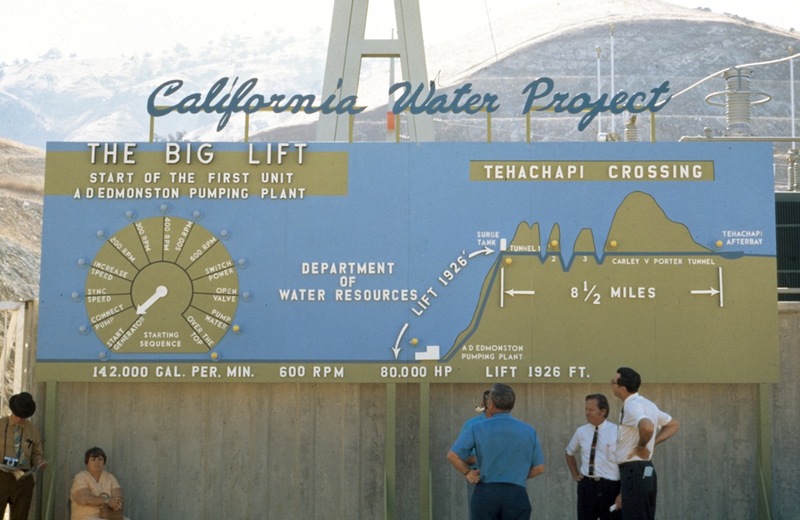 The State Water Project fueled California’s economic growth, allowing Silicon Valley to rise up and Southern California to grow as well as bringing more farmland into production. However, the project remains controversial, with critics saying that the water projects punish those who live closes to the rain and reward those at the greatest distance. The export of large amounts of water from the Delta by both the State Water Project and the Central Valley Project has impacted the Delta and imperiled native species, many who are listed as threatened and endangered. The State Water Project was designed to be much larger, but only the first phase has been completed, and it is unlikely that the other features will ever be built out to the original specifications. There are several reasons: Many Northern California rivers that were envisioned to be included in the system have since been given Wild & Scenic protected status, any future expansion would be subject to extensive public review, and there are laws and regulations reflecting changed societal values that have come to pass since the project was first planned. 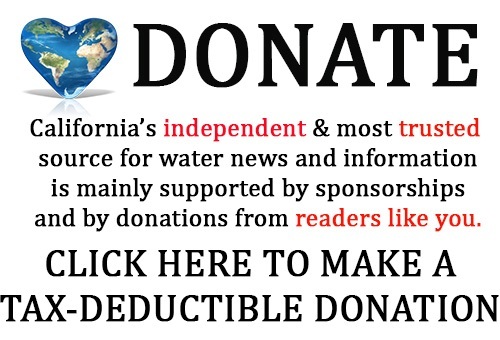 Click here to return to the California Water Infrastructure main page. This article was written by Chris “Maven” Austin and published on July 5, 2015.